"Miracle" might be a rather unusual name for a cat - but in this case, there's no title more fitting. Little is known about the stray white cat up until last Friday. That's when his life almost ended outside the Özel Akgün Tem Hospital in Istanbul, Turkey. Miracle's troubles began as he attempted to wander into the facility through a revolving door at the front. 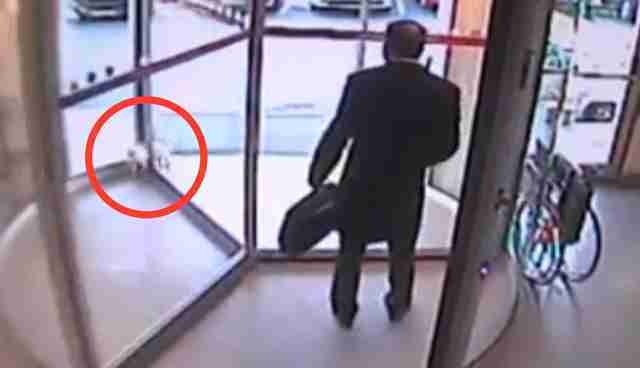 A man leaving at that moment had failed to notice the cat, and inadvertently pinched him between a glass panel and the door jamb. The man stopped immediately, but the damage had been done. Surveillance footage shows the stuck cat writhing in pain as others gathered to try to free him. Among those who noticed the commotion at the door was Halil Akyürek, an emergency room doctor who works at the hospital. He ran in to help. "The cat's neck was totally stuck," Akyürek told news outlet Haber Turk. "He was struggling and having trouble breathing. I put my hand on the back of his head and properly removed him from the door. We immediately began CPR." Dramatic video shows Akyürek massaging the cat's heart, coaxing him back to life. Later, the cat was rushed inside the hospital where he was given oxygen. Meanwhile, Akyürek consulted a veterinarian to learn which medicines the cat needed, and how to apply them. Things only got better from there. Inspired by the cat's quick recovery, Akyürek was one of those who helped decide on the his new name. But then the physician went one further. He gave him a home. Turns out, the former stray who came so close to losing his life was brought back from the brink to have his life transformed - and that may be the greatest miracle of all.